Montage of prominent College buildings. 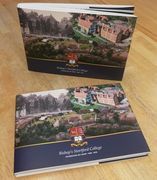 Individually signed and numbered by the artist, former member of staff Simon Bailey, this montage shows the development of the College over its history and is printed on very high quality textured 310gsm paper. Measuring 500mm x 400mm and suitable for framing, it is a limited edition print of 150. The book costs £34.50. Postage and Packaging is an additional £6.50 for UK, £11 for EU and £17.65 for Rest of the World. If you wish to pay for the book by credit or debit card, please record this in the "Other comments, special requirements" box at the bottom of the ordering page. You will then need to contact the College Finance Office on 01279 838017, or fees@bishopssstortfordcollege.org with your card details so that your payment can be taken. Merchandise is also available to purchase for collection from the Development Office at 10 Maze Green Road, Bishop’s Stortford, with payment by cash/cheque made payable to Bishop’s Stortford College being accepted at the time of collection.